Prof. Alan Adler of Western Connecticut University found that the image color could be reduced with a diimide reagent, leaving colorless, undamaged linen fibers behind. This confirmed spectral data that indicated that the image color was a result of complex conjugated double bonds; however, it proved that image color was found only on the outer surfaces of colored image fibers. Until this time, we had assumed that the image color was a result of chemical changes in the cellulose of the linen. The most likely change would involve the dehydration of the cellulose to produce conjugated-double-bond systems Adler’s observations proved that the cellulose was not involved in image formation. This is an extremely important observation. This fact was confirmed by the observation that the image color on some fibers had been stripped off of their surfaces by the adhesive of the sampling tapes. 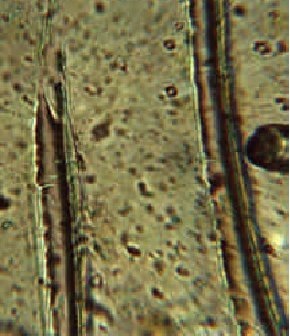 The photomicrograph shows the places where two fibers were pulled out of the adhesive leaving their colored coating behind. The coating is too thin to measure accurately with a standard microscope; however, it appears to be 200-600 nanometers thick (in the range of a wavelength of visible light). The bands of color and the fact that all of the image color appears only on the outer surfaces of the fibers, suggested that image formation involved a thin layer of impurities. Because the cellulose was not colored, the impurities had to be significantly less stable than cellulose. carbohydrates from crude starch would color much more easily than would cellulose as a result of either thermal dehydration or chemical reactions. Any image-formation mechanism that would result in color formation inside the linen fibers must be rejected. Some "theories" that have been mentioned that would cause coloration inside fibers are penetrating radiation, high temperature scorching (hot statue, painting with a torch, etc. ), and catalyzed dehydration of the cellulose. Image fibers are colored only on their surfaces.